“Please free those in Zambia. And to the rest of the freedom fighters in this world: don’t give up” – a message from an iconic African artist and activist. On this unique compilation, Dr.Thomas Mapfumo & the Blacks Unlimited perform before a live audience celebrating the tenth anniversary of the human-rights-conscious Sanctuary For Independent Media in Troy, New York. The performance fuses old and new beats to level out fan preferences while enhancing the spice of Chimurenga variety. ‘Danger Zone’ is the name of the new CD by guitarist and singer Thomas Mapfumo: ‘The Lion of Zimbabwe‘. Since the early 70s he writes and plays his own music together with his band The Blacks Unlimited. Music that is based on chimurenga. A rousing musical style invented by Mapfumo where he adds sounds and beats to the traditional mbira (thumb piano). With his long dreadlocks Thomas Mapfumo is a striking personality. In the 60 he played western covers but also composed his own music. In 1978 he started the band The Blacks Unlimited and invented and developed the chimurenga. A new musical style with quick hi-hat rhythms in combination with the national instrument the mbira (thumb piano). This combination is unique and made him a national star; especially when he imitated the twinkling mbira patterns on his guitar. He got the nickname ‘The Lion of Zimbabwe’. Mapfumo is loyal to the people of Zimbabwe who had learned not to love their own culture. 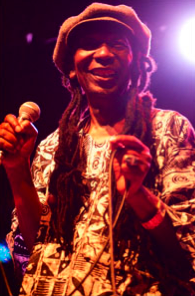 Thomas Mapfumo honors his culture: he sings in Shona, plays the chimurenga and uses the mbira. Moreover, he sings about (political) abuses and has become the voice of the Zimbabwean people. 2015 has been a busy year for the Chimurenga Maestro who has toured many global spots from his home turf in Oregon, USA to England, Australia, Mozambique and South Africa. On a fusion of Chimurenga Music as a purveyor of black consciousness, human rights and entertainment, Mukanya continues to preach the peace and democracy agenda through music. In September 2015, he re-visited Mozambique, a country that shares a lot of history with Zimbabwe. That was after he had toured South Africa earlier on in September. This second Mozambique tour was a sequel to the 1967 tour with the Springfields band when Mozambique was still Portuguese East Africa. This time when Mukanya performed in Mozambique, he recollected the shared camaraderie and military support Zimbabwean Freedom Fighters received from Mozambique during the days of the struggle. Even as he sang the “Zimbabwe-Mozambique” song in the 80s, he had so much gratitude in his mind. Mozambique was another home for troubled Zimbabwean refugees “Kuyaira kwevasina musha”. It accommodated thousands of our refugees at Chimoio, Nyadzonya and Mboroma. Even after the Nyadzonya-Chimoio massacre by the ruthless Rhodesians, the struggle never recoiled until independence came in 1980. When Mukanya made his second coming to Mozambique this September 2015, he was humbled and honored to meet with the Governor of Tete, the Mayor of Chimoio and other very important delegates from the government of Mozambique who acknowledged his special role in the cry for a stable Africa. It was a bittersweet platform as they shared notes on the struggle for independence and the need for continued peace and development efforts in the region. With that, even the overjoyed Mozambican fans reassured Mukanya that he still remained a committed champion for human rights and peace. They still acknowledge the role Mukanya played in the struggle to entertain, educate and motivate the masses. As the Lion of Zimbabwe, Mukanya continues to roar for social justice and the fight against poverty, arbitrariness and corruption. Now he challenges the youth to take over the relay stick and vigorously spread the same message until Africa becomes a united, examplary and prosperous continent worthy the respect of the global community. Aluta Continua! Thomas Mapfumo performs on stage during Live 8, Africa Calling, in 2005. As Bob Marley is to Jamaicans or Fela Kuti is to Nigerians, Thomas Mapfumo is to Zimbabweans. The bandleader is a superstar in his home country, both for his masterful blending of traditional sounds with world music and for his powerful political messages. Mapfumo has been a tireless critic of the colonial government of former Southern Rhodesia, as well as the dictatorship that presently rules Zimbabwe. 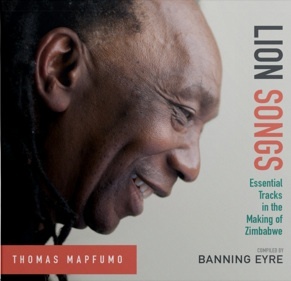 Music critic Banning Eyre has written a new biography of Mapfumo and compiled an album of his music, both titled Lion Songs: Thomas Mapfumo And The Music That Made Zimbabwe. Eyre recently joined NPR’s Robert Siegel to discuss Mapfumo’s music and his career of moving people — both on the dance floor and in their political views. One element that stands out in Mapfumo’s music is the way he uses a traditional thumb piano called the mbira, which Eyre explains is believed to have the ability to contact the spirits of ancestors. Mapfumo translates music traditionally played on the mbira — a repertoire of songs thought to have been around since ancient times — to the electric guitar. Other former British colonies in Africa saw black-majority governments take over once given independence, but in Southern Rhodesia, colonial whites declared their own independence and wanted to remain a white-ruled country. A 1977 song, “Pamuromo Chete (It’s Only Talk),” was Mapfumo’s response to a statement by the leader of the white government, Ian Smith. Now living in exile in Oregon due to his outspoken criticism of Zimbabwean president Robert Mugabe, Mapfumo yearns to go home, according to Eyre.